After tiring of their day jobs in the police, Claire and her husband Nick wanted to try something altogether different. Claire's love of vintage and Nick's love of food gave them the idea to open a traditional tea room, and vintage themed catering service. 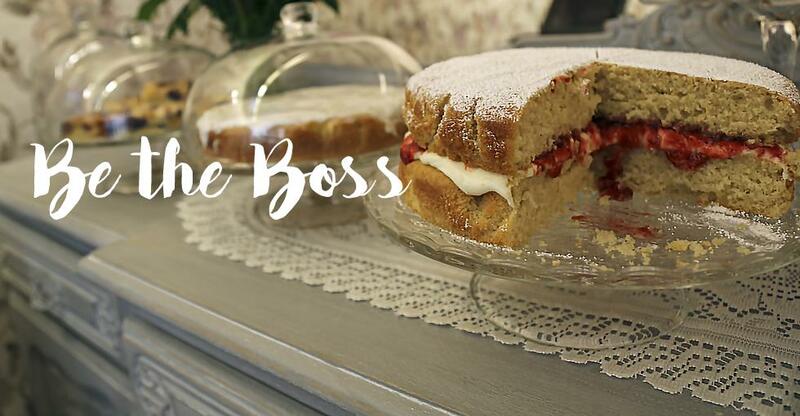 Together they run their new tea shop business Rose & Olive in Uckfield, East Sussex. They also provide catering services with a vintage twist at pop-up events. Here Claire and Nick talk to us about the challenges of changing career, starting a new business and working together. I’ve always loved the vintage theme, my husband trained as a chef and we just thought it would be really nice to combine the elements of vintage and afternoon tea with cooking, so that inspired us to want to run a business like this. Was there a pivotal moment that made you finally take the plunge? Well, we were both police officers in the Met for quite some time and I think it got to the point where we wanted something different in our lives. We wanted to be able to work on our own terms. Nick wasn’t always a chef, but he took himself off to college to train part-time. He then decided that he wanted to start working more with food, so it was at this point that we considered starting our own business. We initially purchased a catering business called Mrs Tea, but it wasn’t really operating so we basically just bought boxes of china. We had to re-do the website and build a client list from scratch so it was essentially starting again. We were operating like that for about a year, then we decided that we wanted to put ourselves into it so we named it after my two nans, they both loved a cup of tea and I just thought it was a really nice tribute to them. We then emailed everyone we knew and got into social media and grew our client list that way. What is your favourite thing about running a business? I love working for myself. I love the flexibility; I love that I meet new people every day. I love creating wonderful memories for people. W ith our tea parties, we are often celebrating: hen parties, birthdays or weddings, and it’s just really special to be part of people’s occasions. Have you encountered any challenges and how did you overcome them? It’s been challenging. I think the biggest shift was going from being employed to self-employed. It’s such a leap. It was difficult initially because you’re used to doing one type of thing. It was a mind-set thing, you get so used to getting your pay on a certain day, but now I wouldn’t change it for the world. I think when we got to grips with being self-employed, earning what you want, working where you want, doing what you want – there’s no ceiling. What makes you different from other tea shops? We are all about memories and creating new memories. We evoke people’s memories with the china and the décor and just the way we’re so personable with people. It’s very different when you go out to the chains and it’s soulless. Here we try to create a very warm heartfelt environment. We go all over with our pop-ups, we’ve been to really large vintage festivals like Salute to the 40’s. We do corporate events too, like we’ve been to ITV studios. We take our tea concept to wherever people want it to be. We bring the bunting, the flowers, the china and the cakes and just go where we are wanted. The most rewarding thing is the people you meet, the memories we create and just knowing that all the effort you put in is appreciated. People come back for more and recommend you. I would say do your homework and make sure it’s definitely what you want to do. Obviously, it’s a lot of hard work running your own business and you have to be prepared for that. The best skills you can have are talking to people and being able to cope with pressure, a lot of the events we do are very busy so you need to be able to work under pressure. If it’s something you want to do, and you’re confident you can make it work, then don’t ever give up. We had challenges initially when we were wondering if we had done the right thing, but you just have to stick with it. Whatever your dreams are, go for it. And if you’re working with your partner just try and have different skills so you’re not under each other’s feet and you have different aspects covered.